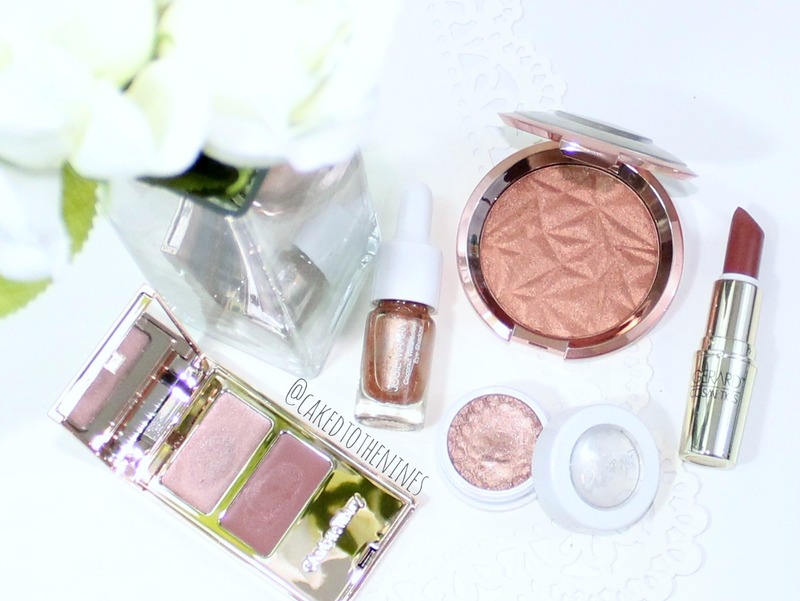 Rose Gold Makeup For Summer | Charlotte Tilbury The Spy Who Loved Me, Josie Maran Rio De Rose Gold eyeshadow, Becca Blushed Copper, ColourPop La La eyeshadow, and Gerard Cosmetics 1995 lipstick. Rose gold makeup just screams summer to me. It warms up the complexion and adds a nice glow that we all want during the warmer months. Personally, I think rose gold makeup for summer is a nice change from the usual bronzey summer makeup look. Though, don’t get me wrong, I still love me some bronzey makeup. I’ve just been leaning more towards rose gold makeup lately. For the eyes I’ve really been loving ColourPop’s eyeshadow in La La. It’s a beautiful metallic rose gold eyeshadow that is so effortless to wear. You can simply sweep this all over your lids, and it’ll look beautiful (see swatches here). If you want something that lasts a long time and is waterproof, check out Josie Maran’s Rio De Rose Gold Coconut Watercolor eyeshadow. It comes in a little bottle with a doe foot applicator. It applies like a liquid and lasts all day so if you’re one who needs your eyeshadow to last a long time, this is a great option. The Charlotte Tilbury Filmstars On The Go duo in The Spy Who Loved Me contains a gorgeous, yet subtle, rose gold cream eyeshadow and a berry cream blush that pairs well with the eyeshadow. You can even use the cream blush on your lips, which makes this the perfect travel companion. I’ve done a full review with swatches here. Another product I love for the cheeks is Blushed Copper from Becca. This shade is slightly more copper, but it has rose gold tones to it. If you dust this on lightly, it looks more rose gold than copper. Plus, the packaging is rose gold and who doesn’t love good packaging? I’ve also done a review with swatches on this here. Last is a lipstick that is a rose shade with brown tones to it. I’m not a huge fan of Gerard Cosmetics, but I do like their lipstick in 1995 because I think it’s a beautiful rose/brown shade that pairs well with rose gold makeup. The formula is a creamy matte so it’s not too drying on the lips, which is nice for the summer. What’s your favorite rose gold product? Let me know in the comments below and don’t forget to subscribe for more!